We often need to develop PDI jobs and transformations to load CSV files. In an ideal world, any data source will provide us with a single format for ingestion. All files look the same and a single PDI transformation can load them all into a database table. But as is often the case, some files will have slight differences. Or not so slight ones. We’ve faced on several occasions the need to ingest files where the number of fields varies; or the order in which they appear; or their names. If we only have a small number of formats to account for we can get by with two or three different transformations, one to load each format. But it may not be that simple. If the number of formats is too large, or if there’s no way to determine which format to load based on some criteria (filename, source, etc. ), we need something smarter. 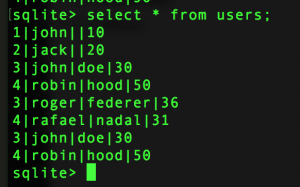 And this is where metadata injection comes in. PDI has supported Metadata Injection for a few years now. The basic idea consists of having a transformation parse metadata information in runtime, which may vary depending on the circumstances, and then injecting this metadata into the configuration of steps sitting in a separate “template” transformation. Depending on what the data looks like, the template transformation is injected with different values, changing parts of its behaviour. Here’s a video to show you how it works, voiced by none other than Matt Casters himself. Your mileage may vary, but PDI Metadata Injection is a very powerful ally when it comes to creating more generic algorithms. 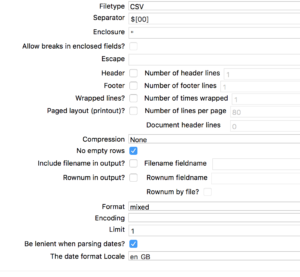 Our aim is to build a set of transformations that will load any CSV file format, with varying layouts, according to a set of rules for what we are interested in. Our goal is to parse all three files using a single PDI transformation with Metadata Injection, allow all configurations to come from an external data dictionary and support future changes to file formats as much as possible. Remark: not all PDI steps support Metadata Injection. In particular, the Add Constants and Generate Rows steps don’t have support for it, so we can’t use them to add the missing fields. The Data Grid step, however, supports Metadata Inection and can therefore be used, followed by a Join Rows, to add extra fields, which can vary from one file to the next. Also, the Select Values step isn’t really necessary, as we can inject the list of output fields directly in the Table Output step. But this way we can also attach a Write to Log step right before the Table Output, if we need to debug our transformation. The Text file input step will list all fields that exist in the file, with the desired destination names; the Data grid step will include whatever fields are missing from the input file (e.g., there’s no last name field in the first input file) and add a single row of data with value null; once joined to the main data flow, the select values step re-orders the fields in the order we want them and finally a table output step will write to the target database table. If we take our data dictionary to include 4 fields, id, first_name, last_name, and age, the Text File Input step must have 3 fields configured, id, first_name, age; the data grid would have a single field, last_name, with a single row of data and null as value; the Select values step would then re-order the fields as id, first_name, last_name, age. This transformation is the brains of the process. 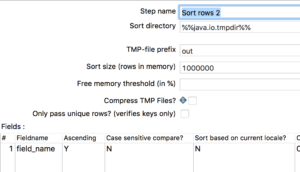 It must determine the file structure, fill in the gaps, and then inject the missing bits in the template transformation so it can load the files one by one. Here’s the structure of the transformation. We’ll go over the various steps, one by one, and see what’s happening at each stage of the process. As often happens, injector transformations tend to have multiple streams of data, each carrying part of the set up to the metadata injection step. The filename is first set as a parameter, so that this transformation can then be called by a parent job, once for each of the files waiting to be ingested. The get variables step then retrieves this value. We then read the header row using a Text File Input step. We use character $ as the separator, as it’s a character that does not occur naturally in the data. This character is ASCII’s character 00, or the null character. It should be safe under most uses, but your mileage may vary. As we want to read the header row, we must disable the header option (otherwise it’ll be skipped), and limit the step to read just the first row. In the fields definition we read the whole row as a single field, called line. This is our result. 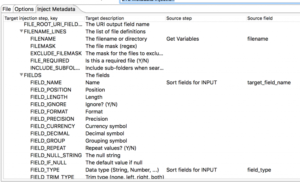 The field_ordinal field tells us the order in which the fields occur in the data file. The reason for that sort step will become clear in the next part. We need a data dictionary, where the relationship between data fields coming from the files are mapped to the target fields on the destination database. Here we use a data grid, but on a production ETL this information would be stored in a database. We then sort by field name, ahead of joining it back to the field names coming from the file. The next step is joining the two streams of data, the field list coming from the data file and the field list coming from the dictionary. 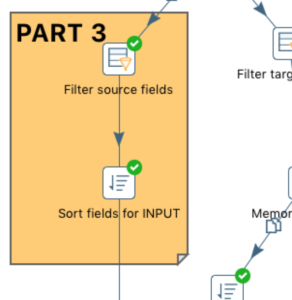 The merge join step requires both input streams of data to be sorted by the join keys, which is why we needed to sort both data streams immediately before. The need for a full outer join will be clear in a while. The data combines field names coming from the data file with field names coming from the data dictionary. We now start preparing the various data streams to be injected. The first one is the list of fields to inject in the template’s Text File Input step, which will contain all the input fields present in the data file. A Filter Rows step allows us to select only those rows that correspond to fields present in the data file. This list of fields exactly matches the order in which they occur in the data file. The next step is to prepare the list of target fields. These will be injected in the Select Values and Table output steps. This way we get a single row of output for each combination target_field_name-target_field_ordinal. 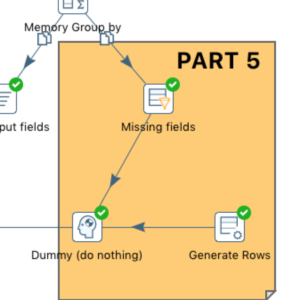 The Aggregate fields are not used for this section but will be necessary for the next one, where we inject the Data Grid step to add the missing field information. This is the list of output fields, in the order in which we want them. The order is determined by the ordinal field coming from the data dictionary, so it’ll be the same order regardless of which file we’re reading. In some cases we have files that are missing some of the fields. 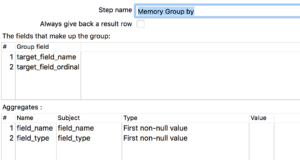 We can identify those rows, since they will have a null field_name after the Group by of the previous section (that’s why we chose the “First non-null value” aggregation; target fields with non-null field names exist in the data file. Target fields with only null field names do not exist in the data file. And we’ll use this information (only target_field_name and field_type) to inject into the Data Grid step. However, since PDI 7.1, if nothing is injected we get an error. If there’s nothing to inject, then Data Grid returns 0 rows. When we then cross-join them in the injected transformation the result is 0 rows of data. This behaviour is not observed in a non-injected data grid: even an empty Data Grid step will always output 1 row of data (with no fields and no values). But on Metadata Injection it will output 0 rows. With this fix we ensure there’s always at least 1 row of data arriving at the Metadata Injection step from this data stream. At this point we have 3 incoming data streams. We add a new one, directly from the Get Variables step (this will inject the filename), and we’re ready to go. In the Data Grid step we inject the field names and field types of those fields that exist in the dictionary but not on the data file. As value, we inject the field field_name, which is always null (above we filtered only null values). 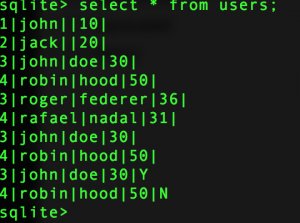 In the Select Values step we inject all the target_field_names coming from above, regardless of them existing in the data file or not (as missing fields are added in the Data Grid step). On the text file input step we inject the filename coming from the Get Variables step right at the beginning, and the field name and data type coming from the dictionary (we use the target_field_name directly and that way avoid renaming the field later). And that’s it (almost!). Lets test it. The data loaded successfully, even though the 3rd field is missing from the file. All 3 files loaded correctly, even though they had different structures of data. Our work is done. We should test whether our transformation can cope with new fields showing up in the files; fields that the data dictionary isn’t yet aware of. Indeed, two more rows of data were inserted, and the right fields were written to the right columns. Doesn’t have the new column, obviously, as the ETL isn’t yet aware of it. With this transformation we are able to ingest CSV files with variable schema, and add more columns as required. All the data dictionary information can be put in an external database, to make maintenance easier. This allows our ETL to accommodate changes in the data format as they occur. Of course this is not the end of it. We’ve only scratched the surface in terms of detecting and parsing the various changes in format. Files can have different separators, encodings, and even date formats, which need to be accounted for. But it’s a start, and allows us to, at the cost of spending a bit more time in the initial development, implement an ETL that can, hopefully, survive the test of time. All this is possible because of PDI’s Metadata Injection step. Unfortunately, not all PDI steps can be injected yet so our template algorithm may need some adjustments in order to only injectable steps. However it’s a much better position to be in than having to develop different transformations for each possible format and having ETL errors trigger more and more development work. Remark for Windows users: to use the transformation as is you need to have SQLite installed, and you’ll need to change the database connection in the template transformation to point to a valid path for the data.db file. It’s finally here. After a few months of work, a lot of bugs fixed and a last minute refactor of all database connections, we are proud to release the first version of GEM, Generic ETL Machine. 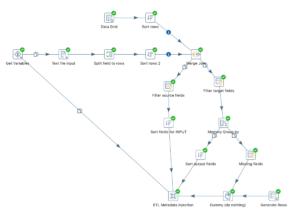 It’s an ETL framework based on Pentaho Data Integration, to automate most of the common tasks that take time to develop, are essential to ensure a proper maintainable ETL, but that are hard to explain when the project’s stakeholders want to see their data. Things like enabling a solid logging mechanism with email alerts; data lineage to allow us to trace the data from the reports and dashboards, to the cube, then the fact table, then the staging tables, then the source files or databases, complete with line numbers, date the record was extracted, etc; a way (still very archaic) to define the order in which several tasks should run; a way to quickly deploy from the development laptop to a server and switch environments, from dev to test, to prod; and all this, of course, configurable. This is still the first version and a lot of work is left to do. For the time being there’s no user interface to display the status of each ETL run or the results, all rollbacks must be performed manually in the database and there’s no way to schedule different tasks at different intervals. 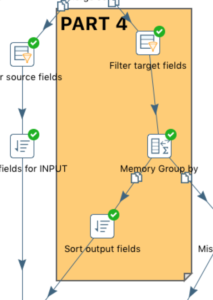 That’s all on the roadmap, time permitting, together with increasing the number of available samples (CSV files and web services to name a couple), support for PDI clusters, output and input directly into Hadoop in its multiple shapes and forms. But it’s usable as it is (well, sort of – we only support a couple databases on each stage for the time being) and it’s been allowing us to spend a significant larger amount of time dealing with what really matters when we have to develop an ETL from scratch: the data analysis and the design of the data model. Not enabling file or DB logging, or setting up the email step for the 500th time. Clone it, fork it, commit to it, enjoy!